A 1933 Maserati 8C 3000 Biposto driven by Fagioli and Nuvolari, a 1935 Riley MPH and two Bentleys are early entries for the Bonhams Amelia Island 2016 sale. The race-documented 1933 Maserati, Riley and Bentleys are from the Willem van Huysteen Collection and will feature prominently at the March 2016 classic car sale in Florida. Bonhams will sell sports cars from noted Pennsylvania collector Willem van Huysteen, each of which has been thoughtfully acquired, extensively maintained and actively campaigned around the country and on international events at the 2016 Amelia Island classic car auction on 10 March 2016 at the Fernandina Beach Golf Club in Florida. This will be Bonhams second Amelia Island sale. The British auctioneer only joined established brands Gooding and RM Sotheby’s at Amelia Island in 2015. The 1933 Maserati 8C 3000 Biposto is one of the much-hallowed sporting cars from the glorious early days of the company when Maserati campaigned and won numerous events, including Grand Prix and road tours. This particular car has origins in the era when luminaries such as Sommer, Fagioli, Biondetti and even Nuvolari campaigned these cars, all of whom were connected with #3004. Raced in Italy, throughout Europe, and in Great Britain – specifically at Brooklands, the car disappeared during the war but was later discovered as part of a large cache of Maseratis in the 1960s, whereupon it was restored by a noted British restorer back to its Grand Prix two-seater configuration. In Mr. van Huystee’s care it has been exquisitely mechanically restored at the hands of noted technical expert Chris Leydon and been a regular sight at many competitive events in America including “The Grand Ascent” hill climb at The Elegance at Hershey each summer, the Pittsburgh Vintage Grand Prix, at Lime Rock Park, and on the 2001 Mille Miglia in Italy. The 1935 Riley MPH Two-Seater Sports, the “Swiss MPH”, is an example of the most fabled model this British manufacturer built. This particular car is arguably the best known of all, having been delivered new to Switzerland where it was raced in its earliest days by original owner and Swiss Riley importer Jacob Waeny. It was there that it was seen by a young Bob Lutz, also of Swiss nationality, who having admired it in the 1940s was able to secure the car in 1963. It remained with him for nearly 50 years, a trusty stablemate as his career burgeoned with pivotal roles in Ford, Chrysler and General Motors. In van Huysteen’s care for the last few years, the Riley has been technically improved and regularly used. In 2014 the car was driven on the Pebble Beach Motoring Classic, covering some 1,600 miles down the West Coast of America to arrive at the annual Concours d’Elegance in August where it received an award in the Pre-War Sports Racing Car Class. Alongside these is a pair of Bentleys, one of which is from the illustrious Vintage Era – a 1924 Bentley 3-Liter Red Label Speed Model Tourer with original open sports touring coachwork by Park Ward. 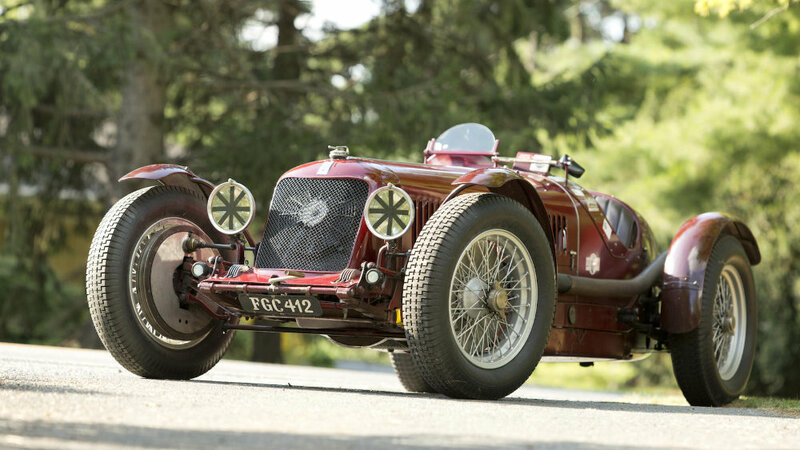 It has been successfully campaigned on several Mille Miglias, the famed Colorado Grand, many Bentley Drivers Club events, and a number of car shows in America. The other is a Derby-built 1935 Bentley 3 ½-Liter from the era after acquisition by Rolls-Royce. This car is an archetypal example of the second generation of Bentleys, frequently dubbed the “Silent Sportscar,” and carries elegant light sports saloon coachwork also from Park Ward.